I’m pulling from the very top of the bucket list on this one as I embark on an amazing journey across the vast Canadian tundra. I’ll spend the next five days touring the small Subarctic town of Churchill, Manitoba with expert nature tour guides, Natural Habitat Adventures, in search of the region’s greatest predator – the polar bear. Why Take a Polar Bear “Tour”? As independent travelers at Vagabondish.com, we rarely recommend tour guides and tour operators. It’s not that we dislike them or don’t find them useful; quite the contrary. There are simply many remote destinations around the world where organizing one’s own transportation, accommodations, and itinerary can prove exceedingly difficult. Heading north into the Canadian Subarctic is one such place where the logistics are mind boggling. There are no roads to Churchill, Manitoba. In fact, foolhardy travelers have but two options: a punishing, 40-hour train ride from Winnipeg with no guarantee of actually arriving in Churchill, as weather routinely delays or altogether cancels this route. Or, option two: a direct, two-hour flight from Winnipeg to Churchill, which NatHab (as the company is affectionately known) provides as part of their Classic 6-Day Polar Bear Tour. Brent has been involved with wildlife research, expedition travel and adventure tourism for 25 years from the Arctic to the Antarctic. Brent has traveled to the Arctic every year since 1993, from Siberia, Alaska and Canada to Greenland, Iceland and Svalbard. His passion for the Polar Regions is infectious and he loves to tell a good story, especially about his encounters with polar bears and penguins. … and I can personally vouch for his amazing enthusiasm and knowledge. As with many folks, my flight didn’t arrive in Winnipeg until mid afternoon. Day 1 is typically spent making last minute preparations in the city before heading off into the wild Canadian Subarctic. Every NatHab Classic Polar Bear journey begins in Winnipeg – affectionately known as “Winterpeg” among Canadians. This northern city in Canada’s Manitoba province boasts some of the most grueling winters in the whole of North America. The weather is relatively temperate for the few hours that I’m in town, save a pounding rain that never lets up. It’s an appropriate welcome to a region of Canada where few people, even Canadians, relish visiting. The weather also provides a stark realization: my thin leather gloves and jeans will be no match for the Subarctic climate. The Winnipeg outfitter of choice, MEC, provides a slew of expedition grade clothing. After revealing to the kindly cashier there my intention of visiting Manitoba solely to chase polar bears, she warns that I best be careful. I smile excitedly, noting that that’s exactly why I came. She laughs nervously, diverting her eyes. Clearly she’s heard one too many horror stories of eager tourists passing through Winnipeg on (unbeknownst to them) a one-way trip to Churchill. Polar bear tour guests overnight at the delightfully vintage Fort Garry Hotel – a turn-of-the-twentieth century luxury chateau. The staff, décor, and amenities are all what one would expect of four star accommodations. Tip: Supplies are extremely limited in Churchill. For last minute trip essentials, check out Don’s Photo – a great independent photography supply store. For outdoor gear, visit MEC for a huge selection of outerwear and other outdoor essentials. I return to the hotel for a quick fitting of an expedition-grade parka and boots. After which, the night begins with an orientation dinner. Brent provides a brief but educational overview on pack ice, the Subarctic climate, environmental conditions in Churchill, and what exactly gives this remote town the unofficial moniker, “polar bear capital of the world”. He also provides a rundown of the logistics of the trip to answer any lingering questions regarding “the boring stuff” – meals, hotels, etc. Lastly, he knows we’ve all come to see the polar bears. But he confidently assures us that, by the last day of our trip, we’ll realize there’s far more going on in Churchill than just these might predators. Breakfast starts at six o’clock. 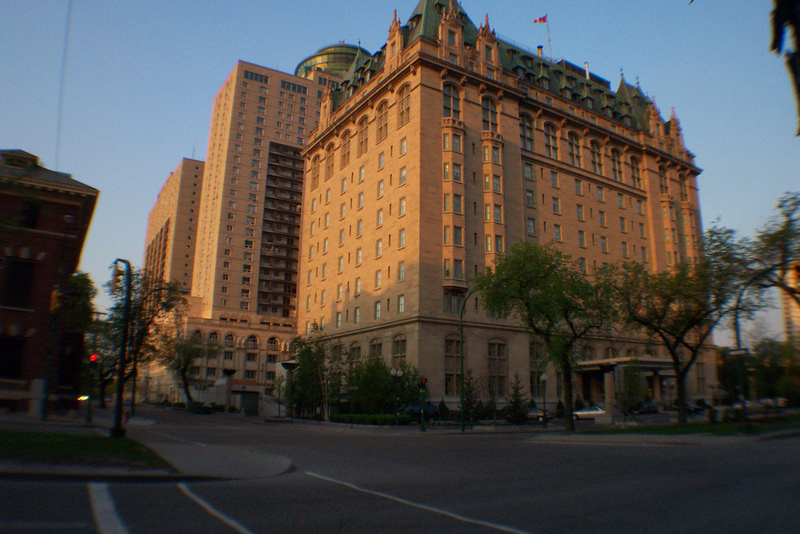 I was assured the Fort Garry’s was a “can’t-miss” buffet. What seemed like an oxymoron turns out to be true ”¦ and quite good. Everything short of the oatmeal and muffins is made to order by one of several chefs – home fries, pancakes, omelets ”¦ the works. Our small group of five meets in the lobby of the Fort Garry at 8:30 a.m. sharp – the sharp is key. Brent has assured us that the one and only thing we’re responsible for on our trip is to be on time. After a quick shuttle to the airport we board a privately chartered Boeing 737 for our two-hour flight to Churchill (in case you’re wondering, the Winnipeg to Churchill flight alone starts at approximately $1,000 if booked in advance. Again: one less thing to worry about with NatHab). Considering the extreme, unpredictable weather in this part of the world, the flight proves rather uneventful. Cloud cover over this section of Canada is almost impenetrable, making aerial photography impossible. The terrain, as best I can tell through hazy white cloud streaks, grows increasingly grim and barren as we press on. For a town with fewer than 700 permanent residents, the Churchill airport is larger and more active than one might expect. They actually have multiple gates! Perhaps most unexpected is the severe weather or, more precisely, lack of it. In my dreams of the Canadian Subarctic, my naivete summoned visions of unbearable cold beneath an endlessly snowing sky. Neither proved true. There’s nary a snowflake on the ground and the temperature hovered around a “balmy” 30 degrees (F). Cold, for sure, but nothing like what this New Englander was anticipating. Shortly after our arrival, Brent is quickly engrossed in radio chatter with other NatHab expedition leaders. Best we can tell, there’s a “pizza delivery” of the utmost importance. It being lunch time and all, this doesn’t seem all that interesting. As luck would have it, our arrival coincided perfectly with a “bear lift” (i.e. the “pizza to be delivered”). For those of us from areas of the world without a prominent polar bear population, it’s hard to imagine these creatures as an integral part of daily life. But in Churchill, polar bears often find their way into town in search of food and other things of interest. Informally known as “bad bears”, these bears about town are tranquilized and brought to an official holding facility, known amongst town residents as “bear jail”. The jail is exactly as one would imagine. Bears are kept in individual holding cells, without any human or animal contact. The interior is affixed with artificial lighting to coincide with sunrise and sunset so as not to interfere with the animals’ natural biological rhythms. They’re treated entirely humanely and provided with water, but no food. The reasoning behind imprisonment is simple: to provide a negative association between “coming into town” and “being kept in solitary confinement”. A team of biologists monitor the jailed bears to determine their release back into the wild. First time offenders may be pardoned after a week or so, while multiple offenders may be imprisoned for several weeks. Upon release, a bear will be tranquilized and provided a helicopter ride back to the tundra. Tranquilized Polar Bear Preparing for "Bear Lift"
The “badder” the bear, the further they’re released from town. While tranquilized, they’re in a waking coma – completely immobilized, but conscious of their surroundings. It is for this reason that, upon awakening, they launch into something of a disoriented, adrenalin-fueled state. Biologists monitor the released bears until they’re satisfied that the bears are safe to continue on their own in the wild. After a surprisingly fantastic bison cheeseburger at The Tundra (who knew lunch in this barren part of the world would be so good? ), we’re back at the hotel. Due to limited accommodations in Churchill, NatHab uses a variety of hotels and lodging during their group stays in town. We found ourselves at the Northern Nights Lodge – clean, friendly, minimalist accommodations exactly as one might expect in this remote part of the world. Our inaugural launch out on the (actual) tundra to search for polar bears and other Arctic critters is scheduled for 3:30 prompt in the afternoon. I’m positively giddy in a way that only a child trying to fall asleep on Christmas Eve could be. He glares at me wryly, shaking his head with no hint of entertaining a follow-up question. I recall the unamused MEC cashier: This ain’t no disco; this ain’t no foolin’ around. We meet our driver, Baz, from Great White Bear Tours promptly after 3 o’clock. At first blush, this truck mechanic-turned-tour driver appears to be all business. He’s courteous and professional, but with a no-nonsense cadence. As it turns out it’s just his eleventh day as a bona fide tour driver and he’s a bit nervous. Over the next few days, we’d work hard to get him to crack a smile, but he was all marshmallows on the inside. Arrival on the tundra is rather surprising, as our tour group in unison remarks at the distinct lack of snow and ice. The upside is that the bleak, snowless environment provides the perfect backdrop for spotting stark white wildlife. Arctic fox, ptarmigan and the elusive Arctic hare would now stand out in glaring relief. Or so we thought. Time and time again, we’re “skunked” – the term used when one spots a bear or other critter in the distance only to realize that it’s a snow drift or other inanimate object. Hour by patient hour, we watch the sun fade behind dense cloud cover, growing increasingly hopeless that we’ll ever spot a polar bear. Near six o’clock, we scope out the perfect viewing spot and “make camp” at sunset in our rover. Brent and Baz carefully lay out an elaborate cheese and wine spread for the group, as we all remark how perfectly odd it is to enjoy a romantic candlelit dinner in the middle of nowhere amongst countless unseen predators. We watch the sky fade to an ink blue, unable to discern a single star past the clouds. Sadly, our final bear count on day one: zero. It’s disappointing to be sure. But this is nature after all and wildlife is unpredictable and, well, wild. On our return trip to Northern Nights Lodge, my expedition mate, Charlie, and I pass glances of growing, uneasy disappointment to one another. Though we don’t say so, we’re clearly wondering the same thing: could we have really come all this way, to the Polar Bear Capital of the World, only to be skunked by snowdrifts and random ice flows? Could we actually return home, polar bear-less? As it turns out, that wouldn’t be further from the truth. None of us – even our fearless expedition leader – would be prepared for our first, amazing full day on the tundra. I, for one, have a deep affinity for omelet stations. Awesome opportunity! This is an adventure that’s high on my list too. Unreal! Sounds just like an Aussie outback adventure … ‘cept here it’s really hot and crocodiles aren’t cute and fluffy. What a great opportunity, I’m totally jealous! Looking forward to more. oh – you’re leaving us hanging!! i can’t wait to do this. it seems just incredible. Awesome!! Can’t wait to read more! Great article. I am planning to visit one day. There is a lodge that I would like to stay at in Churchill – The Lazy Bear Lodge. The National Geographic did an article about 18 months ago about accommodation options that ‘had a sense of place’. The Lazy Bear was one that was identified.